I moved this past week. I've gone from having an entire house last year, to a tiny bedroom, and then to another tiny bedroom but with part of a basement for my use as well. Now I've just moved into a tiny studio. I literally have an eat-in kitchen, a tiny bathroom, and a small main room -- and that's it. And this is why downsizing is important. 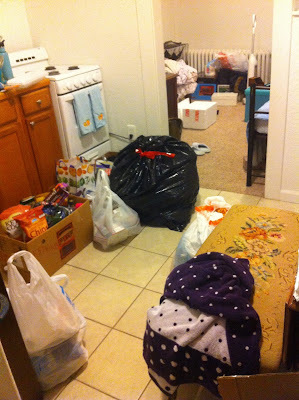 Of course it won't look this bad forever -- right now I just haven't had a chance to unpack anything yet. But when you have this much stuff, and you have to unpack it all and put it away before you can even move around in your apartment, you start to question why you have so much stuff. Some of my clothes I don't even wear, let alone like. Why do I still have them? Why do I have sheets I don't use because they are too stained? I'll be going through things, both as I unpack and after I get settled in. I have this week off from my nanny job, so I should have plenty of time for it. Plus, my mom and I are doing a community garage sale on Saturday. Once things are put away, the unnecessary stuff has been rehomed, and my life has some order to it once again, I'll be able to think more clearly. Downsizing is a lot of work!